Set on the apron of Rajasthan's Ranthambore National Park, remote and secluded Aman-i-Khás is a true haven of tranquility, offering guests exceptional levels of luxury in a pristine wilderness setting to make your vacation to India unique and memorable experience. At Aman-i-Khás, only bird calls interrupt the day's peace, and at night, under a magnificent star-strewn sky, the calls of the wild send guests to sleep in the safety and warmth of their king-size beds. Reminiscent of the splendid traveling tents used by the dynastic rulers of the Moghul era, the permanent tents are privately located around the camp's central outdoor fireplace. Surrounded by cushioned, stone banquettes, the fireplace provides the camp's focal point, as well as breathtaking vistas of the Aravalli Hills, dotted with crumbling ruins from another age. 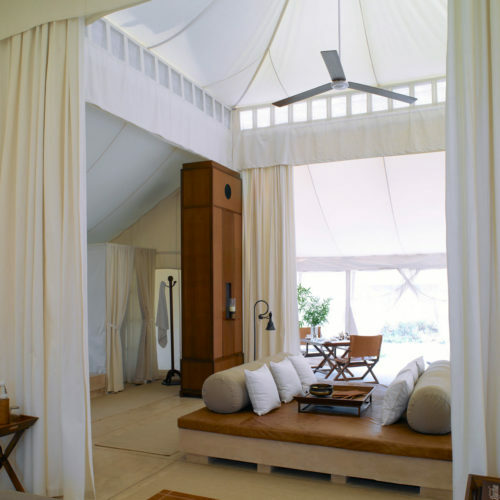 The 10 air-conditioned tents have soaring 6m canopies and delicately draped screens of fine cotton, which separate these luxurious tents into different areas for sleeping, dressing, bathing and living. 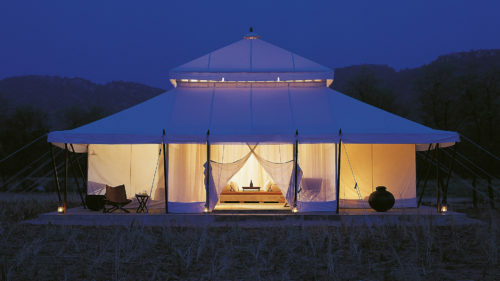 The Aman-i-Khás tents are decorated in a Moghul-inspired style, and the subtle hues of creamy canvas, swathes of airy-white cotton and khaki cushions on toffee-colored hide provide the perfect foil to the vivid colors of Rajasthan. 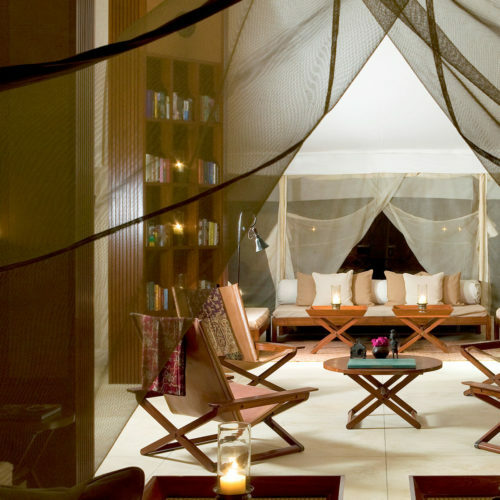 The accommodation Tents, the Dining Tent and a locally-inspired Spa Tent are reminiscent of the splendid traveling Moghul tents which were favoured by the Emperors and their entourages during the hunting seasons of this richly elaborate period. The wooden ceiling fan turns in harmony with nature's gentle sounds, encouraging sound and soothing sleep. Everything, from the earthy scent of the breeze and the spectacular views, to the camp's delectable Indian and world cuisine - with most ingredients coming from the camp's organic gardens, combines to provide an atmosphere of relaxation and well-being beyond compare. Nature is all around, but every modern luxury is on hand. A natural watering hole nearby lures smaller wildlife, but for sightings of one of India's famed tigers Aman-i-Khás provides twice daily safaris into the National Park. A customised open-top safari vehicle takes guests, twice-daily, on guided excursions into the core of Ranthambore National Park. Camel safaris in the outskirts of the park and through traditional villages are also available. 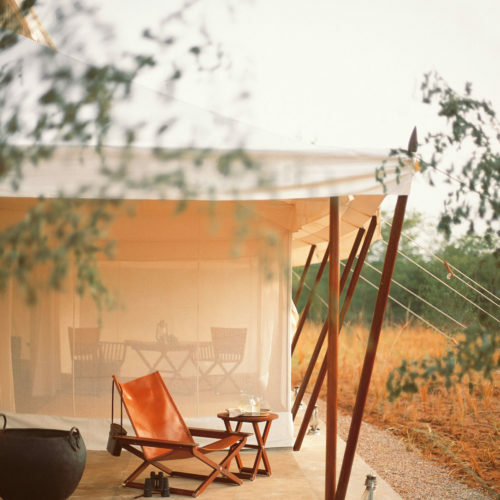 The Aman-i-Khás was featured in our article best tented camps in India.